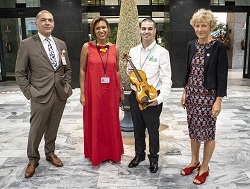 ©FAO/Roberto Cenciarelli 24 July 2018, Rome - A violin crafted from wood sustainably produced in Brazil’s Amazon was donated to FAO’s Forestry Department by the Oficina Escola de Lutheria da Amazonia (OELA) for permanent exhibition. The gift, in recognition of FAO’s work to promote sustainable forest management and to improve livelihoods, followed a musical performance, ‘Sounds of Sustainable Wood’, opening the Sustainable Wood for a Sustainable World event in the sixth World Forest Week at FAO headquarters in Rome. Event participants were reminded of the symbolic significance of the violin as a representation of sustainable wood value chains and of the many benefits that sustainably manged forests can provide, including the joy of music, as a sonata was performed on two of the Amazonian wooden violins. The instruments were made with wood from a privately managed forest certified by the Forest Stewardship Council (FSC) and crafted by students in the OELA school for luthiers – specialists in making stringed instruments. The school, which initiated its activities in 1998, builds on research that identified tree species suitable for making musical instruments in the Amazon. The musical performance was used to set the stage for discussions on sustainable wood which included the heads of delegations from Canada and Guatemala, as well as representatives from the International Family Forestry Alliance and the Swedish Forest Industries Federation. Panellists reviewed contributions from wood and wood fibre to sustainable development, as well as examples of how to advance sustainable forest management. Representatives of the international organizations leading the Sustainable Wood for a Sustainable World initiative also participated, including the Center for International Forestry Research (CIFOR), FAO, International Tropical Timber Organization (ITTO), the World Bank and World Wildlife Fund (WWF) International. Speakers discussed actions to promote the sustainable production and consumption of wood in the context of reducing deforestation, improving rural livelihoods and inclusive value chains. They also highlighted the fundamental role of sustainable wood products in the bio-economy and in addressing climate change; policies for wood in construction; and the need to address existing market constraints. The two violinists, Douglas Oliveira Nóbrega, from the Brazilian city of Manaus and Giorgio Sasso, from Rome, were accompanied by the cello of Andrea Fossa, also of Rome. Nóbrega grew up in Guarulhos, on the outskirts of Sao Paulo in southeast Brazil, and began playing the violin at age 13. His first contact with the craft of violin-making came when he invested in a handmade violin after being advised not to play on industrially-produced instruments. This triggered his interest in the luthier craft. After being engaged as a violinist by the Amazonas Philharmonic Orchestra, he eventually relocated to the city of Manaus in the heart of the Brazilian Amazon, and graduated as a luthier from the OELA. Sasso is a soloist and Director of Insieme Strumentale di Roma, which specializes in music from the 17th and 18th centuries played on period instruments. The sonata performed Friday was written during that period by composer Arcangelo Corelli.